But when fan and junior cyclist David McCarthy saw Kittel on the ground in victorious suffering, he didn't lend the winner a helping hand. 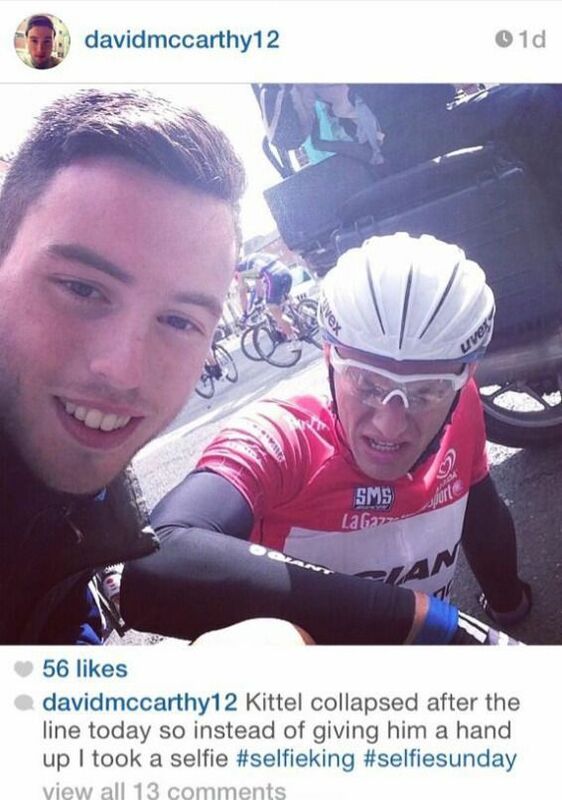 No, he took a selfie with Kittel instead — then bragged about the decision on Instagram. "Kittel collapsed after the line today so instead of giving him a hand up I took a selfie #selfieking #selfiesunday," McCarthy captioned this since-deleted photo. Not surprisingly, McCarthy's selfie did not engender good will from the cycling community — not to mention the Internet's ever-vigilant morality police. Pro cyclist Nicholas Roche posted this condemnation to his 71,000 followers. McCarthy quickly got the message, deleting his photo and posting this apology to Instagram. Kittel, for his part, gave the younger cyclist some sage advice on Monday via Twitter. Was taking the selfie with the fallen Kittel a really douchey thing to do? Yes. Was it kinda funny though, in a douchey sort of way? Also yes. In the grand scheme of things it's not a very big deal at all, though — so good on McCarthy for his quick apology. But we do live in one weird, weird world.